Editor's note: This story has been updated to include additional information about the U.S. Army Corps of Engineers assessment of dams in the Houston area. “We still have entirely too many blue tarps, empty homes," said Steele, who still sees local residents living in trailers parked in the driveways of their damaged homes. “It’s still a big issue." Steele said when she travels around the district, she hears from voters that they either don't know who Babin is or say they never saw him in the aftermath of the storm. Babin, who didn’t respond to a request for comment, has tweeted multiple times about his push to send additional federal aid to Texas. Recently Babin, along with other Houston-area congressional members, met with Mick Mulvaney, director of the Office of Management and Budget at the White House, to discuss giving more money to the Army Corps for “future flood mitigation.” The congressman also tweeted that he toured disaster areas with U.S. House Speaker Paul Ryan in the storm's immediate aftermath. “The lack of response from our representative is visceral,” said Sri Kulkarni, a Democrat vying to unseat U.S. Rep. Pete Olson, R-Sugar Land. The prevailing sentiment from constituents in the Republican-leaning 22nd Congressional District, Kulkarni argued, is that "Pete Olson was absent on Harvey." "I certainly want folks to know there are still resources available for Harvey recovery and I want folks to know how hard our congressional delegation worked to secure the $140 billion in emergency supplemental funding for the historic hurricane season of 2017," Olson said. "I’ll continue to fight for Texas’ share of federal disaster and flood mitigation funds if the voters give me that chance." Fletcher blamed Culberson in particular for neglecting two federally owned dams in the area that were built in the 1940s to protect downtown Houston from catastrophic flooding. Addicks and Barker became a flashpoint during Harvey when thousands of homes on both sides of the earthen structures were inundated. In 2009, the U.S. Army Corps of Engineers discovered cracks and voids in the dams, classified them "unsafe" and said there was an "urgent and compelling" need for action. Yet Congress appropriated funds to to begin repairs on the dams, but didn't fully fund them — or a study of how stormwater runoff from new development in the area has stressed them — until after Harvey. The Army Corps has repeatedly emphasized that the dams are not at imminent risk of failure. Rather, it says they are considered in such critical condition because the agency's ranking system places greater weight on what the impacts would be if they ever failed (thousands of deaths, by its own estimates) than on their actual physical condition. “Congressman Culberson has been an asset to go to,” he said. “He and his staff are wonderful and always have been willing to help when we need his help." “My role in Congress will be to exert pressure on the US Army Corps of Engineers ... to take action without delay. No multi-year studies. Action,” Crenshaw writes. But Litton said he’s confident in his knowledge of the district's flooding issues, noting that he's a native Houstonian who has dealt with flooding in his home as far back as 2001 after Tropical Storm Allison. Litton says he's focused on the “critical improvements” needed in the district in terms of flood control, including the Addicks dam in particular. Like Fletcher, he blamed current and past representatives of the district for failing to secure funding to maintain the aging structure. While the federal role in Harvey relief has elevated the issue in congressional races, the impact on statewide and legislative races has been murkier. The Legislature has not met since the storm and isn't scheduled to do so until the next regular legislative session begins in January. Soon after Harvey, Gov. Greg Abbott said he didn’t see the need to hold a special session to tackle the storm’s aftermath or quickly tap into the state’s Rainy Day Fund. He argued the state needed time to get a clearer sense of the federal funding situation and long-term expenses before the Legislature hashed out how to employ the state’s savings account. "I was so frustrated seeing things that the state of Texas could have easily addressed in a special session," said Rita Lucido, a Democrat vying to unseat state Sen. Joan Huffman, R-Houston. "We needed a special session very badly to take care of a whole range of issues." Huffman did not respond to a request for comment. In the aftermath of Harvey, she toured heavily damaged areas in her district and hosted and attended events for Harvey victims, including a town hall with Lt. Gov. Dan Patrick. In November, Huffman penned an op-ed in the Houston Chronicle calling on local taxing entities to assist Harvey victims with immediately reappraising property impacted by the storm. She also mentioned infrastructure projects that needed immediate attention. "We must fortify existing reservoirs and dams and start planning now for the construction of a third reservoir," Huffman wrote. 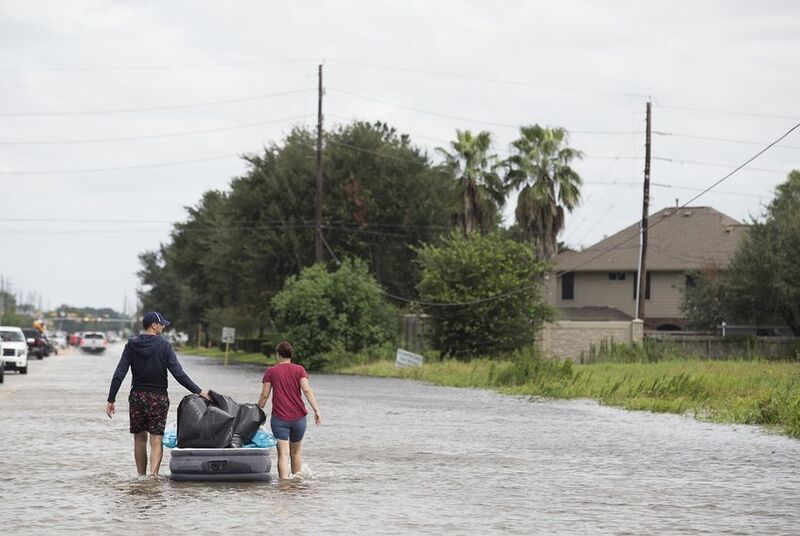 "In fact, there are many infrastructure projects throughout Texas that need to be addressed and we should consider all ideas to mitigate or prevent future disasters." That's a common message among both Democrats and Republicans — it’s not if another storm hits, it’s when. For Steele, the Seabrook Democrat who's vying to unseat Babin in Congress, the post-Harvey political chatter isn’t just another campaign platform — it’s personal. "It’s down to the basic primal issues," Steele said. "When am I going to get a roof? When am I going to get a floor? When are they going to do something to stop this?"